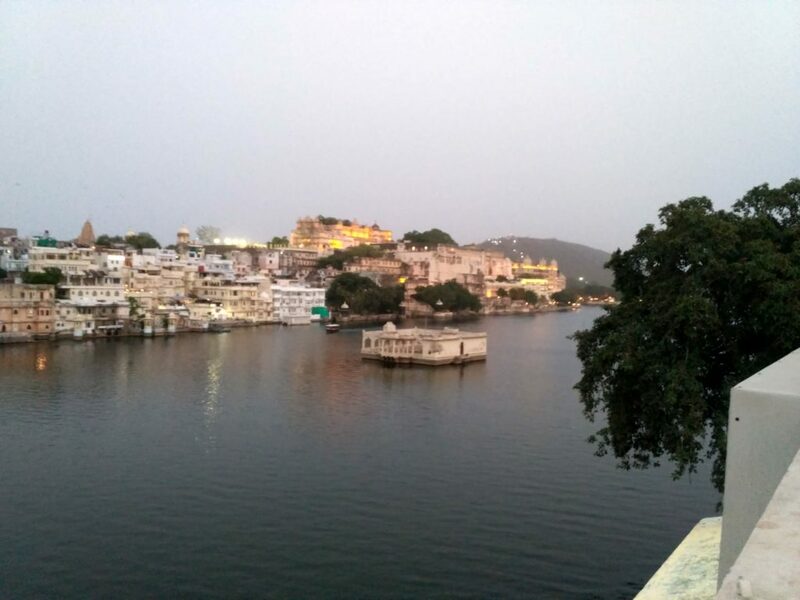 I’ve been spending a lot of time in Udaipur and with a view like this when I visit, how can I stay away? 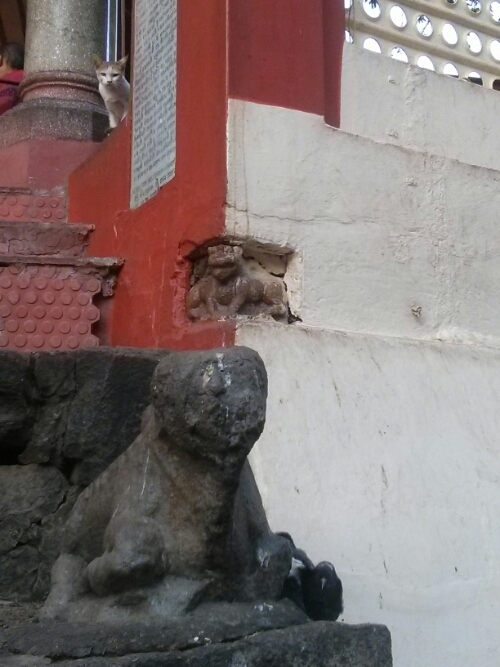 At Kamakhya Debutter temple, a cat keeps an eye on two rock doves sheltering in a nook by a sculpture. Look in the bottom right for the birds. The temple itself is imposing. I didn’t go in. The fast track entry (Rs. 100) was almost as long as the general (free) entry queue to enter the vestibule and visit with the Goddess Who Bleeds* was estimated at an hour and a half and I didn’t feel like paying Rs. 500 for super fast entry. I did see a monkey attack devotees and help himself to their food offerings though, as well as some atavistic goddesses in surrounding chambers. And this curious cat, ready to spring. 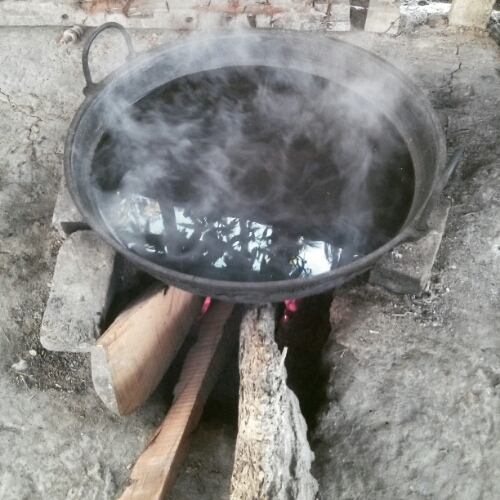 Sal trees reflected in a cast iron kadhai over a wood stove at Narmohan Das’ silk home-industry. The boiling water is going to be used to make dye from harad – a bitter dried seed pod used as a digestive in triphala and churan. Handwoven fabric is dipped into it, allowed to rest, and then hung up to dry. The resulting silk is a beautifully muted charcoal gray – absolutely my favorite color. If you know me at all, you know that I’m very apolitical, fundamentally secular, and that I believe in the fundamental right to suffrage. In fact, one of the reasons I was glad to move back to India from the United States was exactly this: Here, in my motherland, I have and can exercise the right, the duty, the responsibility to cast my vote and actively participate in the world’s largest democracy. In the state elections, I was able to vote (twice) because, miraculously, with proof of address, I was able to find my name (misspelled) on the voter list. Thanks to extremely helpful volunteers in my area, I found the right list and got a temporary voter card in 2009 and also was proud to vote in 2012! My parents also recently moved so on February 18, I went online and did form 6’s for all of us. I took photos, I uploaded them, failed, then resized and then uploaded them, found and scanned address proof for each of us and uploaded that. too. And finally, after 4 hours, I’d done all 3 of our forms. The site assured me someone would come home to verify our addresses. And that’s the last I heard from them until March 8, when I got the first two of four text messages I would receive. Here’s where it all fell apart: I trusted it. I trusted in the process. 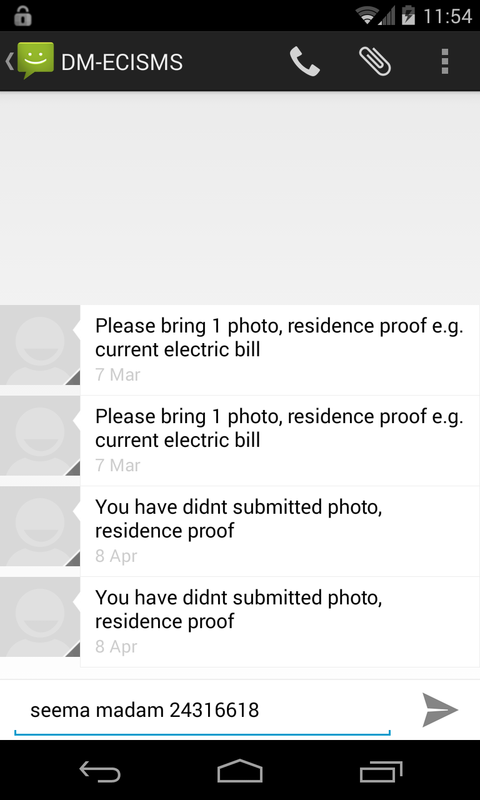 I also parsed this SMS to mean ‘bring them at the time of voting’. Which I was happy to. More fool me. Earlier this month, in April I got another two SMS’s and these alarmed me. I learned that the voter registration had closed and no variation of my name was in the electoral roll at all. My brother and I went to our polling station (but, oops, they’d moved and despite verifying it online on the official Electoral Roll website it wasn’t where it was supposed to be, there was only a godown there. Helpful roadside beedi walas told us where it had shifted) and spent a good half an hour begging, pleading, arguing, finally crying. My name is not on any list. I’ve been struck off the previous building resident list and not added to the new one. Everyone at the madeover school that doubles as the electoral roll office told me it’s my fault for not bringing proof of address and a physical photograph to Mahim before the deadline. I said I’d misunderstood the process. 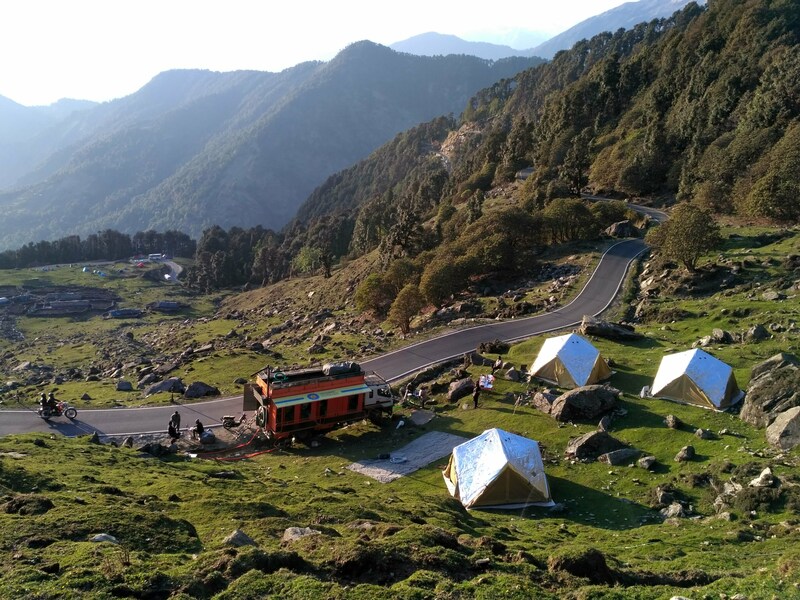 The SMS seemed clear to me, because I wanted to believe, I assumed the process had worked. We spoke with Madam Chauvan, who seemed to be in charge, and she said nothing could be done, and passed on the buck to Madam Seema at Online ops for not being clear in her SMS — Madam Chauvan and her yesmen did agree that the SMS should have said to bring ID proof to Mahim before March 24. On the line, Madam Seema said it wasn’t her fault the SMS could be interpreted wrong, because at her end, her team had sent out more than 400 character long messages. The message I got was only a truncated part of it. Clearly, it was the telephony service provider’s fault. So … the long and short of it is that while I’ll take my passport and try to vote tomorrow, I’m almost sure I shan’t be allowed to. And I can’t resist getting on my soapbox for a moment longer: Where apathy is our middle name, people like me who desperately WANT to vote are penalized. Yes, I should have demanded to know when and where to bring the photo and proof of address, I should have guessed that only a part of the SMS had come through, but I’m clearly an idiot. For, I believed that having submitted my documents and getting confirmation that someone would come for address verification meant that’s what would happen. I seriously believed the SMS meant they’d done whatever and just needed me to bring the proof with me on voting day. (It’s my first national election, man, I don’t know what red tape is involved). I haven’t been able to even talk about it – I feel bereft, ashamed, and upset. I’m embarrassed and I feel like a thousand types of failure because I really believe in the power of the vote. And now I am disenfranchised. of the year, I start to miss the summer so I can go swimming again. 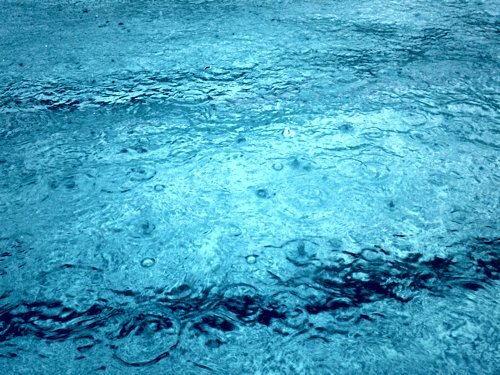 This was taken last monsoon, when the drops on the water made me think of sparkly, pointy, kingly crowns like we saw in our fairy tales. Sorry for the humongous picture but I had to show you perspective. 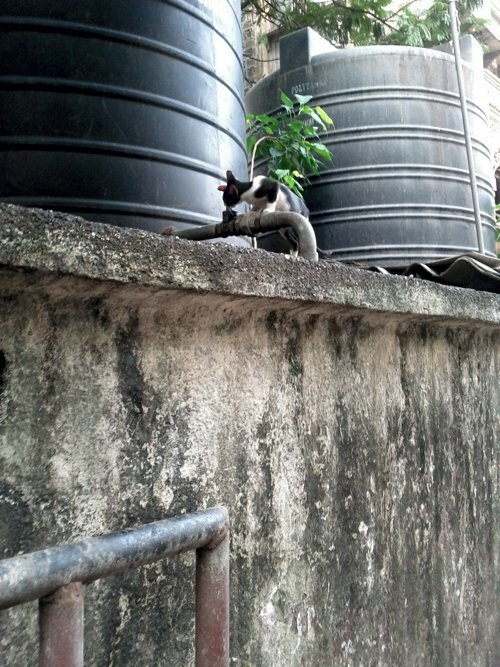 This little one was up high on top of a garage, drinking water from a leak in a syntex water tank pipe. I thought he was awesome.